Belmont’s College of Liberal Arts and Social Sciences has been busy preparing for the 16th annual Humanities Symposium set to take place Sept. 18-Sept. 25. 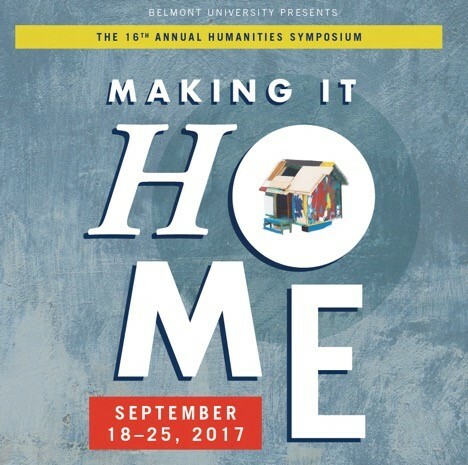 “Making It Home” will be the central theme of the Symposium, with events and speakers that will explore how “we make it home” from an interdisciplinary perspective. There will be 30 speakers from several disciplines of study to touch upon what home means in the context of social work, ecocriticism, philosophy and migrant and refugee studies, among others. The symposium will start with the Monteverde Plenary Address given by Dr. Regine Schwarzmeier of the foreign Languages department. She will introduce the theme of the week and explore the many facets of “home” on relation to the refugee situation in Europe today. The symposium will also feature a few key speakers, including Dr. Jere Surber, professor and chair of philosophy at the University of Denver; Dr. Melissa Snarr, associate dean for academic affairs and associate professor of ethics and society at Vanderbilt Divinity School; Dr. Robert Barsky from the French and Italian Departments at Vanderbilt University; and Dr. Scott Sanders, professor emeritus from Indiana University. The symposium will conclude on Sept. 25 with a reflection and discussion of the themes from the events led by the Symposium Committee. For more information on the symposium and this year’s events, click here or look for event listings on the campus calendar.